Well then, let's see how his first 90 days in office are like and then blast him for failing to fulfill his campaign promises. Hmm, do you have an example? I know a lot of heavily edited videos are on youtube which could portray this falsely. I've heard Trump getting criticized by the media for changing his mind on issues (such as waterboarding) after talking with high ranking members in those particular fields. However, as far as admitting fault goes, I agree he seems to never admit fault. I believe the American people chose a person who will act like a leader. Maybe I'm wrong in my assumption that Trump will bring jobs back to the US, that he will keep most men out of women's restrooms, and prevent the fugitives from continuing to enter the US. And I don't know about you, but I've seen Common Core in the schools and it's not making students learn basic math concepts any easier. It's like "guess and go" for reading. How do you expect a person to be able to read anything if they don't even know how to pronounce the words they see on the page? Donald Trump is but one man, a man who is certainly imperfect in many ways. We all are imperfect, we can't elect a person who is in their 60s or 70s and expect them to have a completely clean record that is accusation free. But that's beside the points I made above. I believe the reason Donald Trump was elected was primarily due to the supreme court and who he is going to appoint to those positions. Donald Trump says that he will appoint conservative judges who will follow the constitution of the US as it is written, he has even put forth a list of those who he is considering and most conservatives approve of that list. On the other hand Hillary did not say that she would appoint judges that would follow the constitution and she did not put forth a list. If you think I've skipped over an important point please let me know and I'll correct that in my next response. BFett wrote: If you think I've skipped over an important point please let me know and I'll correct that in my next response. Yes, the fact that he thinks wind farms kill all the birds, their production puts steel in the atmosphere (yes, the metal) and that they don't work. Benghazi, email scandal, Clinton Foundation, paid speeches from foreign (Islamic extremist supporting) nation, lying to the FBI. Please inform me of anything that I've missed. You missed that her campaign is potentially involved in child prostitution. Yes this is a thing in some of the big retailers. If you decide that you identify as female you can use the woman's restroom. If later that same day you identify as male you may use the men's restroom. A store called Target has been allowing this for the past year or so. You may like gay rights but this is rather disterbing. More so because liberals also want this enforced in public schools. I find this particular picture to be quite interesting. A. That's trans, not gay. They're 2 completely unrelated things. B. You are aware my dad (well, mom at this point) is trans, right? E. How'd you even enforce that? Require ID before allowing someone to go to the bathroom? F. Is 'some people can go to what I believe is the wrong bathroom' really the crisis that's gripping the nation, worthy to be named among the unemployment rate and the refugee problem? Compared to the fact that you elected a president who has seriously wrong knowledge about wind farms in a time where pushing for green energy is so important? I didn't know any of that about your personal life. I also don't know much of anything about the lgbt community. How are restrooms managed now, excluding the law? Wouldn't a gay man feel more comfortable using the women's restroom than with other guys? I dont know. This is a subject I have never discussed. I've never heard of gay men not wanting to use the men's bathroom - they don't identify as women, after all. If you're uncomfortable with the idea someone might accidentally see your bottom parts you can always just use a stall. 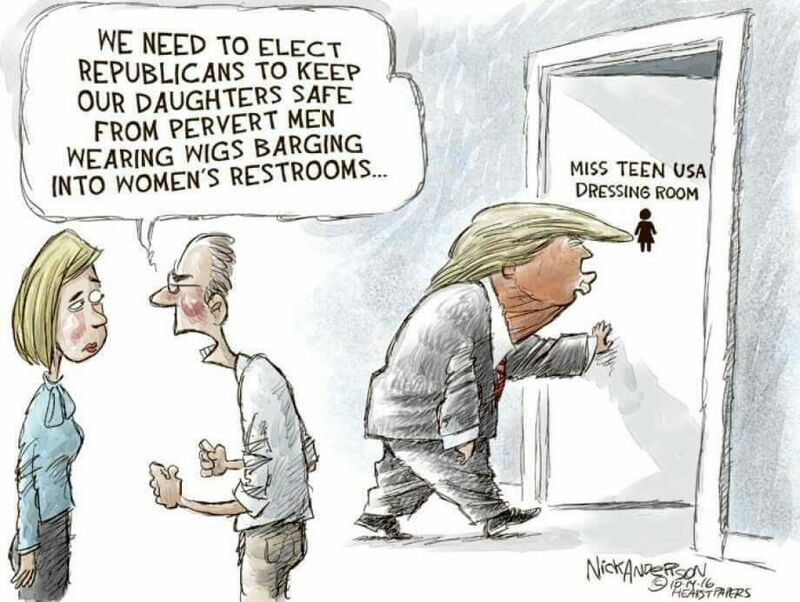 To me its more of the fact that it opens the door for straight people that are creepers going into the other gender's bathroom to be a peeping tom. Then when they are accused of it, they use the "I Identify as ____" even if they really don't and just use the excuse to stalk/creep people. That really doesn't happen often enough to warrant the shame and discrimination against transfolk. I'd go out on a limb here and say that it never happens, because it's an ineffective excuse. Straight, gay, trans, if you are perving on and disturbing people, you are getting into trouble, and if you aren't, what's the issue, regardless of identity? Nobody pushes for separate gay or bisexual toilets, even though you might stand next to someone who's attracted to you at the urinal, that door has been open for them since forever. Actually I have heard of groups pushing for a 3rd bathroom, think there was a Vox or Buzzfeed video with a few million views I came across a while ago. But as you say I doubt its going to go anywhere, wouldn't be cost effective for the businesses to build them into their buildings for how often they would actually get used. And by stalking/creeping I don't mean like staring straight at them and them knowing, I mean more of that they go in there to get a few quick peeks before leaving. Like if straight Highschool boys had the opportunity to use the women's locker room if they reported they Identified as female. Because sexual assault is okay as long as the guy isn't trans. MrPerson wrote: And they could just be hearsay or propaganda, but I could have sworn around where I live I have heard people talk about creepers using the bathrooms for what I described. MrPerson wrote: And I wasn't trying to be discriminatory, all I said its opening the door for those situations to arise. Plus I don't see how you would get caught anyway, as a straight man I could walk into a business like Target and go into a women's bathroom, look around, use it, leave and if the security or cops apprehend me I could just tell them I Identify as a female and they wouldn't be able to do anything about it. Someone identifying as female generally does not look like a regular guy. But even if they do, guess what - gay people can currently spy on people of the same gender in the bathroom as much as they like without getting thrown out! unisex everything. stop giving a frak. cheap, simple, least thinking and faffing. handle sexual harassment like everywhere else. because it kinda works everywhere else as well.